Spotted at a local farm stand. I'm in image overload right now - I have so many incredible images to process and share with all of you (not to mention list in my etsy and Society6 shops) that I find myself overwhelmed and a bit mentally stuck as I try to figure out where to begin. I'm just going to have to jump in and begin or it will never get started so watch this space - there will be lots to share as I shake off my vacation mindset and get back into regular posting again. Hey, welcome back! Missed you and your beautiful photos, so looking forward to seeing lots. Hope you had a great vacation Robin. welcome home (both to Israel and to Blogland) .. cant wait to see your photos .. and I am still giggling over Maya's entrance .. reminds me of a friend's story .. she was so worried about being late her first day back to school one year that she slept in her school uniform including her shoes (no backpacks back in the dark ages)!!! Glad to hear from you and look forward to your pics. Hope you're soon over the jet lag. 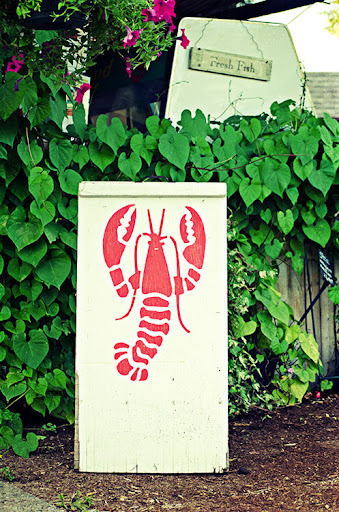 Nice photo of the lobster image on the placard. Fresh fish and lobster - in either place, the time spent (with or without jet lag) there is great, food, conversation and laughter can be intoxicating...am awaiting your pictures! We will be vigilant to see all those pictures you have. Welcome back. Can't wait to see more vacation pix! Sounds like a great time,excep for the jet lag! I bought some pajama pants from LL Bean that were on sale - I'm wearing them right now because I can't sleep - and they have a lobster print, sort of like your image. Looks like New England to me. Glad your daughter is excited about school. My daughter at least had fun picking out an outfit for day one (Weds). Visiting from RT2- hope you can stop by..